1. Describe the structural importance of the neck. 2. Describe the movement components of the neck. 3. Describe the influence of neck control to oral-motor function. 4. List the basic areas of oral-motor assessment. 5. Describe the importance of analyzing assessment results for treatment planning. 6. List the structural considerations of the mouth, pharynx, and jaw. 7. 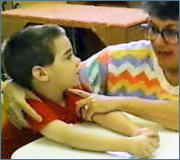 Describe the relationship between oral-motor and postural development. 8. Describe preparation techniques that assist in improving oral-motor function. 9. Describe the normal feeding pattern based on research analysis. 10. Describe the reverse chaining method of teaching self-feeding. Occupational, speech, physical terapists, certified athletic trainers, and other rehabilitation specialists. For special needs requests please contact us by phone or email. contactus@clinicians-view.com Phone 575-526-0012. Fax 575-526-0014.